Square Enix are warming up their engines for this year’s E3 event with the announcement of a special video presentation livestream where the company will share a deep pocket of news and announcements as well as connecting viewers “to the many worlds” they have to offer. 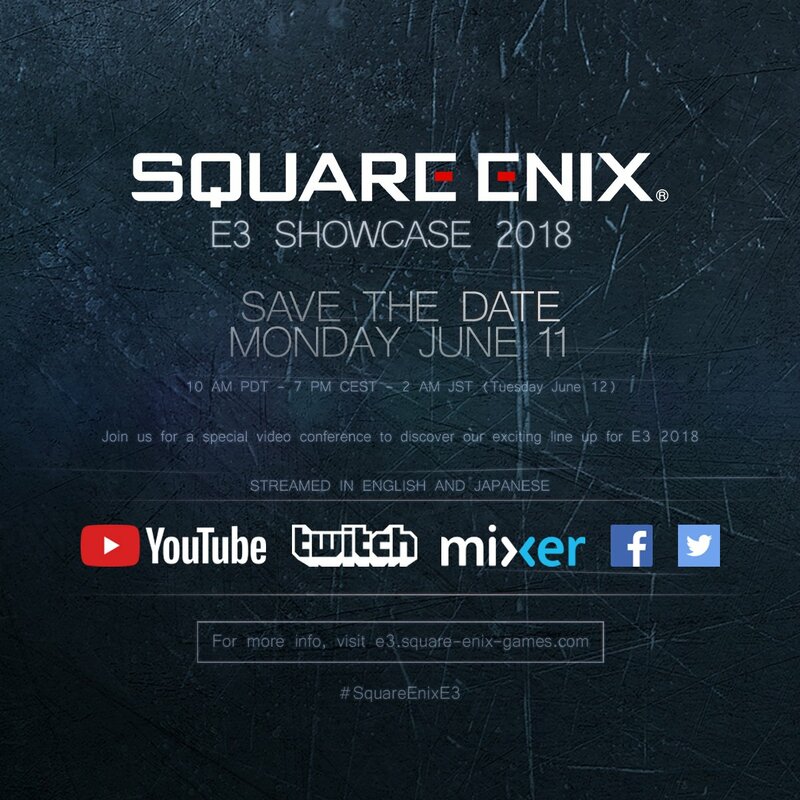 Commencing on Monday June 11 at 10:00AM PDT/1:00PM EDT/6:00PM BST, the livestream will act as a sort of press conference where Square Enix will present their line-up titles, both announced and possibly unannounced, that are set to release later in 2018 and beyond. Additionally, the broadcast will also be supported both in English and Japanese, and can be viewed through your livestreaming platform of choice. Check out the official website here. E3 2018 will take place from June 12 to June 14 at the Los Angeles Convention Center. Stay tuned to Nova Crystallis for all the latest. Posted in E3 2018, Square Enix. Omg, will they show FFXV? When will we get this game after 12 years of waiting? No, it has been released… But I can’t Stopp, Everytime I see these announcements I start to think: OMG, new information about our beloved game? I bet they will disappoint us with even more XV DLC’s than we already have. Only a XVI teaser/trailer can make me happy. That’s what o wanna see. Still a long way off. Better luck on ps5. Wooh boy. Can’t wait to see a bunch of titles I won’t be able to play in the next 10 years! Kidding aside, Tomb Raider is all that matters to me right now. At least I know for sure I’ll get my hands on it come September. First we have to wait till FF VII remake, which I am not interested in. Show us SOMETHING of the FFVII:Remake, i know it’s being re-developed, and going through changes and they prob scrapped all the previous stuff and progress, but i mean at least show us some ART from the game, show us Cloud’s new design for the people who weren’t in Japan when they had that last Event, show us Tifa, Sephiroth, ANYTHING. If FFVII is left behind again that’s going to be very disappointing. At least put together a new teaser. After three years, they have to show something or acknowledge what’s wrong with development. I do not care what they show, just as long as the majority aren’t mobile games like last year’s E3 for the 30th anniversary of the series. God last year’s E3 was freaking pathetic for SE fans. No I don’t hate mobile games, just for an fyi. LOL, does a FFXV sequel sound so bad now? They milked this game, and I actually loved FFXV a lot, despite everything. I look forward to 2019 DLC! Who knows, maybe we can get some 2019 Episode DLC trailers for FFXV? I’m for it if it does the story a justice and has gameplay at least like Type-0. I do. My fingers never work on them no matter how big the screen is. My roommate said the background up there is the buster sword. Type-0 gameplay would be nice (improved obviously) but with camera moving to where the other characters are rather than switching places with the active character. That always kinda bugs me. Was fine in Type-0 cuz it was psp, but on consoles if you can see the other characters the camera should move to them rather than the other way around. Well they’ve already announced a bunch more is on the way. So I’d be happy to see what some of it will be. Granted I want that to be a minor aspect of this E3. Can leave Dissidia stuff out of the important news too. – KHIII trailer, and details. – More info on Final Fantasy VIIs remake. – Information on Final Fantasy XV’s second season pass. – The full version of “Don’t Think Twice”. – More info on the avengers project. – Information on Final Fantasy XI’s mobile remake. – A Final Fantasy XV theme for my PS4 that isn’t locked behind a pre order. – A new Final Fantasy spin off game for the switch. – Theatrhythm for the switch. – Bravely Fourth for the switch. – Agnes Philosophy as its own game. I don’t care if it’s Final Fantasy XVI, or a spin off. I’m mesmerized by the concept, and I want to explore its world, and story. – A new tactics game. – Final Fantasy XVI. WITHOUT Tabata, or Nomura please. Though that part seems likely. – Chocobo Racing as its own game. – Final Fantasy X prequel. – Final Fantasy XIV spin off game. What kind of XIV spin off game did you had in mind exactly? I do not expect much from Square-Enix these days. i don’t care really lol just something, anything. as long as it’s official, we need SOME official visual update that isn’t some crappy bootleg cell phone photos or video. I heard rumours of FF10-3, and I have no idea which route that would take but i’d play it. I hope it is too. God. We need some good news for a change. versus xiii asa part 2 would be awsome. they should make a dark final fantasy. instead of “trying to reach a wider auidence” bullcrap. i wouldnt mind. then again most people arent a dickhead fanboy extremist like me lol. i just wanna play as aranea highwind leaping in the air around tenebrae breaking imperiels til.they.FALL! comrades is like a fat toim howard quote. “it just … works 🙂 ” hehehe yakay there buddy nice try prick face. we know where thy sleep. okay maybe not but the game is REALLLY fuzzy lookin am i right? or am i left ? Oh…and I was thinking FF7 Remake had no chance of appearing at E3…this raises it’s chances to 50% for me. The full version of the Japanese version of Don’t Think Twice (Oath) is already confirmed to be released next month a week or two after E3. Why is Kingdom Hearts 3 under both “dreaming” and “realistic”?